The African painted wolf is in real danger of extinction. An iconic hunter, there are only around 6,000 left, making it one of the rarest species in Africa. Thanks to ongoing conflict with man, infectious disease and the destruction of habitat, the painted wolf has already disappeared from much of its original territory. Today small numbers can still be found in Zimbabwe, Tanzania, Botswana and South Africa, but the clock is ticking. In Zimbabwe in particular the painted wolf is suffering as a result of the country’s worsening political and economic situation and the collapse of eco-tourism and conservation. This is where WVI has stepped in to help local Zimbabwean NGO, Painted Dog Conservation (PDC), in its battle to save one of the continent’s signature species. If we are to save the African painted wolf, we must act NOW. Please donate to help us treat injured and sick painted wolves and vaccinate local domestic dogs in order to reduce the risk of disease for everyone, both humans and animals. Painted wolves are at great risk from infectious diseases, like distemper and rabies, as a result of ever closer contact with the encroaching human population and their domestic dogs. They are often caught in snares set by local people to catch bushmeat. An iconic and beautiful animal, the African painted wolf is completely unique. Although it is genetically related to its African neighbours, the black-backed jackal and bat-eared fox, and to other wolves, it split from the rest of the canine family tree several million years ago and cannot interbreed with any other canid (dog) species. This stunning hunting machine is characterised by its ‘painted’ black, white and tan coat, jet black muzzle and white tipped tail. Each animal has a unique coat pattern, making it possible for researchers to identify individual wolves by sight. Now highly endangered, there are only around 6,000 painted wolves left. They have suffered terrible losses as a result of the destruction of their habitat by man, being caught in snares, and infectious diseases passed on by domestic dogs. 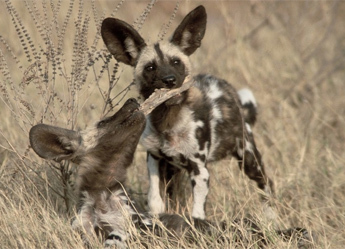 The painted wolf population of Hwange National Park in Zimbabwe is under serious threat. Infectious diseases like distemper and rabies can be easily transmitted by local domestic dogs. And painted wolves are frequently trapped in the snares that the local community use to catch bushmeat. Prior to the first visit by a WVI sponsored vet in 2010, there had been a significant outbreak of distemper in the domestic dog population surrounding the park. Canine distemper is known to be capable of decimating wild animal populations, as happened with lions in the Serengeti in the 1990s. It’s a huge threat to the Hwange painted wolves. Recognising this threat, Painted Dog Conservation (PDC) asked WVI for help. In 2010, we worked together to vaccinate 450 domestic dogs in four communities around PDC’s rehabilitation centre, at short notice. Thanks to our corporate partners, we obtained essential vaccines, medication and parasite treatments. It is essential that strategic vaccination of local dogs continues, in order to build a barrier against transmission of distemper and other infectious diseases, like rabies. The health of every individual painted wolf matters. They are highly sociable pack animals. The death of a pack leader, through disease or injury, can be disastrous, resulting in the breaking up of the group, or even the death of remaining members. WVI supports and trains Zimbabwean government vets and the local staff at the veterinary and rehabilitation unit of Painted Dog Conservation (PDC), helping them develop their wildlife medicine expertise. Following on from the success of the first community clinics in 2010, WVI and PDC ran similar clinics in 2012, 2014, 2015, 2017 and 2018. Although it has taken some years to gain the trust of local communities, the 2015 clinics were so popular we ran out of vaccine (see Progress). During these community clinics we vaccinate domestic dogs, treat them for minor ailments and parasite infestation, and neuter dogs if the owners are willing. While we are controlling the transmission of disease to painted wolves, we are also increasing the health and welfare of domestic dogs and humans by helping control the incidence of rabies. The vaccines give protection for three years, but as there is a lot of movement of domestic dogs into and out of the area, vaccinating every two years gives us a good chance of keeping infectious diseases under control. All this is being done in the name of the painted wolf. The clinics provide PDC with the opportunity to engage with local communities with a view to reducing persecution and improving appreciation of painted wolves and other native wildlife. WVI provides veterinary training to PDC staff, and sends out badly needed equipment and medication whenever possible. The vets we support also treat any injured and sick painted wolves which are being held at PDC's rehabilitation centre when they visit. Painted Dog Conservation (PDC) staff work tirelessly with the local community to collect snares and try to prevent them being laid indiscriminately, reducing the risk to painted wolves. 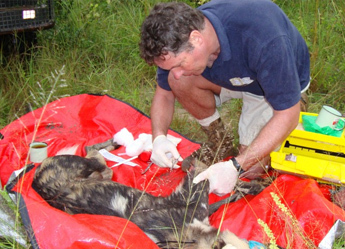 Staff often release animals from the snares, having patched them up as best they can. If the injuries are severe, there is an option to take the painted wolf to a vet, but it’s an eight-hour drive away. Although PDC has its own rehabilitation centre where animals can spend time to recover before being released, there is still a great need for further training in wildlife medicine. On the bright side, their co-operative pack structure allows painted wolves to support and carry an animal that is recovering from illness or injury very effectively, so that rehabilitation following any kind of medical intervention is often very successful. Turning to the future, we are looking at the feasibility of expanding our work to take in a wider area around Hwange National Park, which would include Victoria Falls where there is currently little research into disease. One of our veterinary founders, Dr John Lewis, is currently considering the logistics, training and equipment which would be required in order to set up a comprehensive disease surveillance study over this much wider area. In addition, WVI is supporting veterinary epidemiologist, Alex Tomlinson, who is researching what is known about diseases in general in the area and which of these are known to affect painted wolves. While Painted Dog Conservation (PDC) is our main partner on the ground, the proposed surveillance programme would involve a number of different organizations. The vaccination programme and support for PDC’s staff will of course continue as part of the new programme. WVI has supported regular visits by specialist vets and supplied vaccines to Zimbabwe in 2010, 2012, 2014 and 2015. On each visit the vets have been able to help treat sick and injured painted wolves and vaccinate domestic dogs against rabies and distemper. 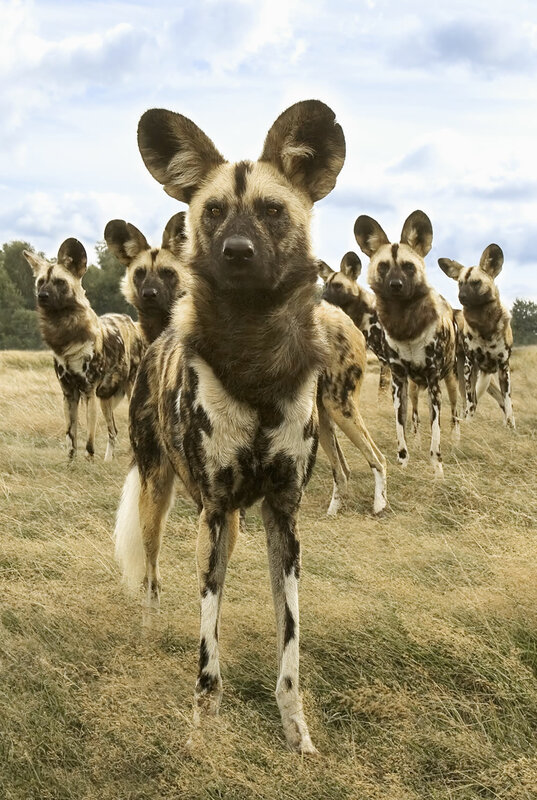 Each time they visit, they continue to train and advise local staff at Painted Dog Conservation. In March 2016, PDC arranged additional clinics in three villages that had missed out in 2015, when vaccines were in short supply. These additional clinics were very popular and resulted in a further 383 dogs being vaccinated. Local schools got involved in helping publicise the clinics and the work of PDC, sending information home via students. Teachers reported that children who were allowed to watch the spaying and castration operations expressed aspirations to be veterinarians, doctors and nurses as a result. The clinics were used as an opportunity to distribute literature about PDC, including the free number to call if people have any questions. This is a valuable chance to explain to local people the dangers and risks of failing to get their dogs vaccinated. 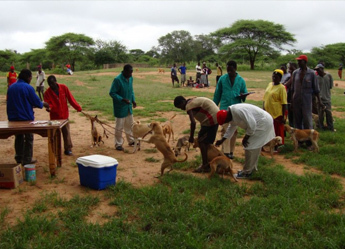 Regular, strategic vaccination of domestic dogs around Hwange National Park creates an effective barrier to the transmission of infectious diseases, like rabies, between domestic dogs and painted wolves, as well as between dogs and humans. WVI's relationship with PDC goes from strength to strength. We are continuing to provide training and equipment, and are helping draw up protocols which have the potential to make a real difference by minimising the risk of transmission of disease between painted wolf enclosures, between domestic livestock and painted wolves, as well as between PDC staff and painted wolves and of course vice versa. As a result of the clinics, the health of the domestic dog population is improved, and PDC has a valuable additonal platform to carry out their essential outreach/public information programmes, which aim to improve local attitudes to painted wolves and other local carnivores. WVI sponsored vets are in regular contact with PDC Project Manager, Peter Blinston, and his team.